"What, your the fly that's been buzzing around me at home and driving me mad?" It couldn't be. "Yes! And I'm hoping you'll stop trying to eat me here, if you do you'll end up finding yourself very lost.!" The fly looked at me and smiled, he had a point. "OK, sorry," I bent my head a little, I'd forgotten a fly was another living thing like me and it wasn't polite to try make it lunch. "Where am I?" I leaned in closer to the fly to get a better look. The fly looked back at me and blinked a hundred eyes. 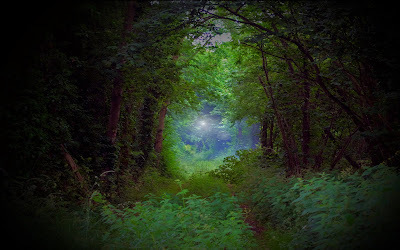 "You're in an Enchanted Forest. I say an as there are many throughout the world, that's where people get it wrong thinking there's just one, and you get some enchanted woods too." He seemed very pleased with himself. I sat back on my hind legs, OK I was open and ready to hear anything. The fly nodded at me and paused waiting for a reaction I guessed, I nodded back, he smiled and carried on. "Now shhh, in a minute over there on that pathway," he pointed to a clearing in the bushes, the trees forming an arch overhead, a rough pathway of sorts could be seen, some mist in the distance. "There's a clearing and they'll both sit down to rest and that's where I'll be taking you to wait for them, we'll be hidden in the bushes watching." My ears pricked up, yes there a little way away but definitely coming nearer I could hear the rustling of some bushes being swept aside and a slight wheezy breath. I turned left and could see some leaves shaking about 100 meters away, my heart started pounding. Oh my goodness what on earth was going on? It all felt a bit trippy and scary and I began to doubt that I should be here. "Come on." The fly urged, his tone commanding, "Hurry up!" I turned to see the fly heading off, I didn't want to loose him in the thick undergrowth, this was all new territory to me. "Coming!" I chased after him as light footed as I'd ever been, moving branches chasing me.